This is a great illustration of how mobile advertising is finally taking off. (In digital media the joke is that mobile taking off is always 'about 18 months away'). This live interface shows mobile ads being served (requested) in real time around the world, on the AdMob Network. 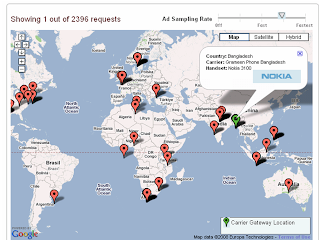 The pointer appears to show the location of the viewer of one of the thousands of ads being served every second, toghether with which handset it went to, while the dial on the right hand side shows the number of ads being served per second. OK - 2,000 ads per second isn't high, compared to the internet - but it is higher than it used to be, and this is a great demonstration of the vibrancy in mobile media.